In a new study by media agency Zenith Optimedia, part of the French advertising conglomerate Publicis Groupe SA, has forecast 9% growth for India’s advertising industry for the year 2010. The agency further upgraded its forecast for international advertising industry growth from 0.9% to 2.2% for 2010. The survey also stated the present state of the Indian economy which still remained against the global slump and grew at 6-7% in 2009. However, the advertising market reacted accordingly and showed up only the growth of only at 1% during the year. However, recovery has been predicted swift and India’s advertising industry will outperform most other markets in 2010. According to Zenith Optimedia, the total ad expenditure for India is projected to go up to the amount of Rs23,631.9 crore this year. In 2009, the ad expenditure was Rs21,602.5, crore. Newspaper advertising, which grew 5% in 2009, seems to rise by at 7-8% annual growth in present year. With improved literacy levels the reach of newspapers is being reached at interior regions of country. According to survey Internet advertising in India is driven by social media. Whereas other, advertising agencies have predicted 12-13% growth for Indian advertising. 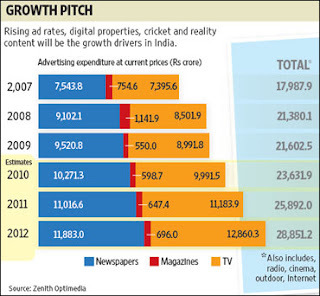 A recent Pitch-Madison report said the ad industry will see 13% growth in 2010 to touch a turnover of Rs21,145 crore. There are many factors for ad growth in India as 6-7% of India’s ad expenditure growth comes from rate inflation alone. Survey has told that globally worst-hit markets are stabilizing and will return to growth in 2011. The Internet’s share of ad expenditure will rise from 12.6% in 2009 to 17.1% in 2012 globally. Ad expenditure fell 23.1% in central and eastern Europe, with drops as steep as 42% in Russia, 44% in Latvia and 48% in Ukraine in 2009. Zenith forecasts a 5.7% ad spending growth in central and eastern Europe in 2010, and 8.5% in 2011.